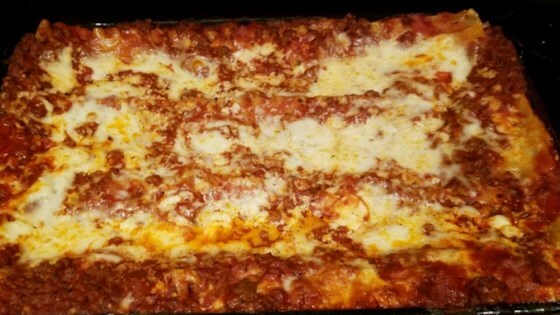 "Classic lasagna recipe that tastes delicious!" In skillet over medium heat, brown the sausage with the onions, garlic and 1/2 the parsley; drain excess fat. Add tomato paste, tomato sauce, water, Italian seasoning, oregano, and basil; mix well. Simmer, covered, for 5 minutes; stirring occasionally. Spread 2 cups sauce in the bottom of the prepared baking dish. Begin layering with 4 noodles, 1/2 cheese mix, 1/3 remaining sauce, and 1 cup mozzarella. Repeat this layer again; the last layer will be noodles, sauce and mozzarella cheese. Cover pan with aluminum foil. Bake in the preheated oven for 45 minutes. Remove the foil; bake, uncovered, an additional 10 minutes, or until cheese is bubbly and starting to brown. Let cool 10 minutes before serving. A crowd-pleasing lasagna with layers of cheese, sausage, spinach, and sauce. My husband made this one night. It was good, but took a long time. Also, the sausage taste didn't really come out, so it seemed a bit of a waste. delicious! I added mushrooms to the meat sauce. Made this for dinner and it was a hit! Minus the spinach which I will try next go round and this time I added ground turkey and turkey sausage instead of italian sausage. Love it! This was awesome, total hit, everyone loved it and kept eating until they couldnt lift thier forks anymore!